Bipedal humanoid robot Atlas was presented during a news conference in Hong Kong in 2013. BigDog and his offspring, Spot, need a new owner. They are not very cuddly, and their looks can frighten bystanders. They have been abused. BigDog is a little noisy. But I’d like to see them well taken care of. BigDog and Spot are the futuristic, four-legged robots you’ve no doubt seen on YouTube videos, tromping through the woods or skittering on a patch of ice and then recovering their footing. BigDog is also the bot that famously got kicked by a human without toppling over — sparking jokes about what will happen when the robots develop enough smarts to fight back against their creators. The company that created them, Boston Dynamics, was acquired by Google in December 2013 as part of a shopping spree; Google bought eight robotics companies that year. In 2015, Time dubbed Boston Dynamics “the coolest company Google owns.” But reports began surfacing last month that Google is looking to offload Boston Dynamics. Why would Google buy and then quickly sell one of the world’s most advanced robotics research firms? And what happens next for Waltham-based Boston Dynamics, founded in 1992 by former MIT professor Marc Raibert? I’ve been asking around. Boston Dynamics’s primary customer was the Pentagon’s advanced research arm, known as DARPA. BigDog was pitched as a kind of robotic “pack mule” that would help soldiers carry heavy gear on terrain that was hostile to Humvees. 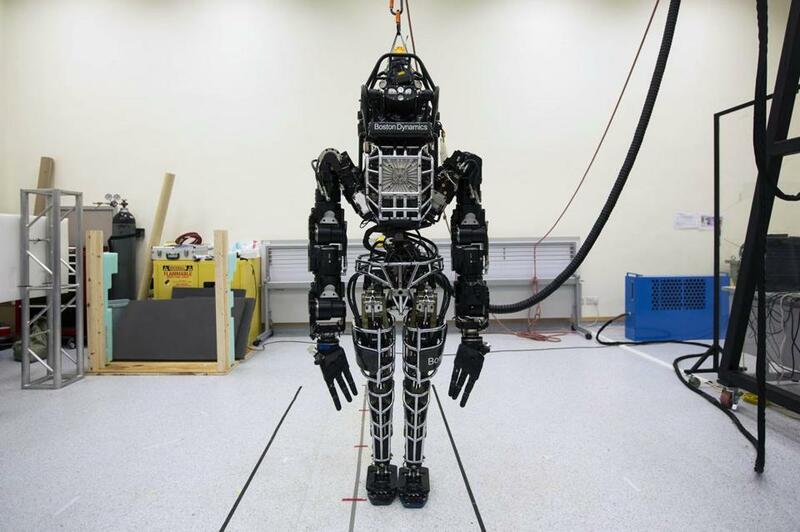 A humanoid robot the company built, Atlas, has been deployed in field trials as a way to send something — rather than someone — to perform repair and recovery tasks in dangerous environments like a radioactive reactor or a collapsed building. Google never explained the strategy behind its purchase of Boston Dynamics or the other seven robotics companies, one of which had designed robotic camera systems used in the movie “Gravity” to create the illusion of weightlessness. But the collection of companies, based in Waltham, Silicon Valley, and Tokyo, never got clear marching orders. “It was a little directionless and un-led,” Olivero says. Robotics industry analyst Dan Kara of ABI Research says there were tales of personality clashes between the Waltham executives and those at Google’s headquarters. “They just didn’t get along,” Kara says. One thing was clear, however: Google didn’t want to be a defense contractor, and it let the Pentagon know it would wrap up its current projects but wouldn’t bid on new work. That move eliminated the main source of revenue that supported between 80 and 100 highly skilled, and highly paid, robot builders at Boston Dynamics. Rubin left Google to start his own company in October 2014. Leadership of the robotics division changed hands several times after that. According to a Bloomberg story last month, one of the executives overseeing Replicant felt that Google shouldn’t be devoting so many of its resources to projects that might take a decade to turn into revenue-producing products for the company. Who might buy Boston Dynamics? Kara says Asian electronics companies might be interested. Toyota has been hiring for robotics and artificial intelligence labs in Cambridge and Silicon Valley, and its new research institute is headed by a former student of Raibert’s, Gill Pratt. One of Boston Dynamics’s creations, the 160-pound, electrically powered Spot robot, made a cameo appearance last week on the HBO comedy series “Silicon Valley.” Two of the show’s main characters were speeding along a back road, and what seemed to be a deer bounded out from the woods. Their car struck it, knocking it to the pavement. It turned out to be the Spot robot, which quickly recovered from the collision and got back on its feet. I’m hoping the bot’s maker can do the same thing.